LB-58 is a various function device which be designed for Europe. 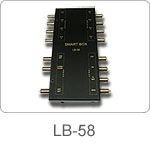 One application of LB-58 is used for Head End of Digital Broadcast. It allows a digital broadcast distribution system to be installed in home applicaiton. 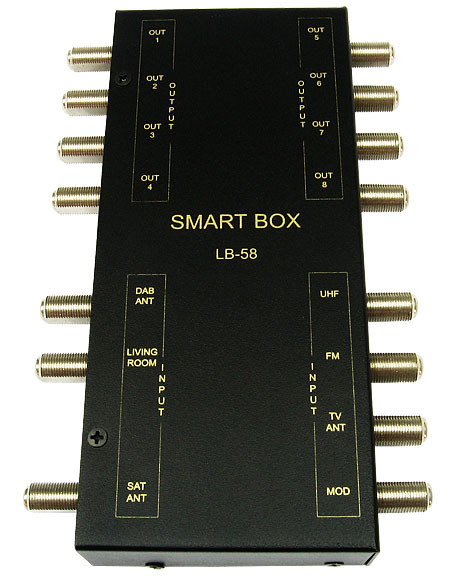 LB-58 combines Satellite, UHF TV, FM radio and DAB sources onto a single TO Living Room output for connection to a master wall plate. A CCTV security camera (with modulator) or similar UHF source can also be connected. UHF signals through from the lounge equipment (e.g. a VCR and/or digital STB) are fed back to the LB-58 via FROM Living Room cable. In LB-58 which feed is combined with the VHF signals and amplified to provide eight additional outlets. All off-air and local CCTV and STB signals (except satellite) are available for connection to outlets in other rooms of the house. The IR Singal can trough between any output of LB-58 and Living Room via STB Remote Control directly. It will help user to swith channel/program, or radio easily. • Inputs for LNB, FM, DAB-T, UHF TV Bands and STB. • Auxiliary UHF input for CCTV etc. • Support Dual Function of RF and base band in IR operation. • Support All Europen Broadcasting.